Chinch Bug problems, while certainly a nuisance, do not pose a health risk as the bugs do not carry disease causing organisms. Although there is no county agency that can do anything about the bugs, the following information may be helpful. The homeowner or gardener is often alarmed when he finds the ground swarming with minute, active, grayish to reddish brown bugs which usually appear in late spring or early summer. When swarming in large numbers, it appears that the ground is moving, usually in one direction. 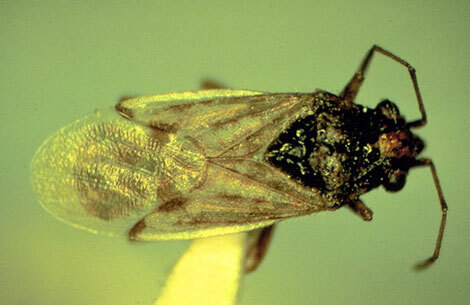 These insects are often found to be the false chinch bug. The adult bugs average about one-eighth inch long and one- twelfth inch wide with a dull gray body, mostly dark beneath, and half covered with whitish wings. The young (nymphs) are smaller and wingless or with wind pads, and have a reddish brown abdomen. These bugs do not normally bite or sting humans. Many types of insects are attracted to perfume or perfumed lotions. If insects are squashed against the skin, it may cause a burning feeling for a short time. As far as is known, these insects do not carry disease. It then becomes largely a psychological problem of seeing masses of minute, swarming bugs on the property. In the late winter or early spring, the females deposit their eggs in the surface cracks of the soil in weed and grass areas. When the young hatch, they feed almost exclusively on grasses and weeds. When warm weather occurs in the spring and drought prevails, the weeds dry up or mature and the bugs scatter to irrigated plants around the home, and congregate in large numbers. Plants on which the bugs remain may be sucked almost dry and wilt. Fortunately, as the bugs finish their feeding and become adults, they will usually disperse within a few days to two weeks and will not reappear unless the same habitat is present next spring. Occasionally the bugs may swarm up to 6 weeks. Before the bugs become adults and are searching for moist foliage, they may enter the home, causing considerable concern, especially where babies and small children are present. Infestations of false chinch bugs may be prevented by spraying vacant undeveloped areas with insecticides and by treating these areas with herbicides to prevent growth of weeds and grasses, or by discing and destroying weeds early in the spring before they become a fire hazard. When swarming starts, keep the grass along the edge of the lot and around the house watered down to the point of leaving puddles. Turning on the sprinkler system for 5 to 15 minutes each hour should be adequate. Trenches may be dug along the border of the property and filled with water to create a barrier. Refill the trenches with water as needed, especially during the warm part of the day. Wash paved areas and water lawns frequently. Insecticides are not very effective unless used over a wide area. Some pesticides will kill the bugs on contact, but during the swarming stages, this gives only temporary control as more bugs keep moving in to replace the dead. Residual sprays which list Chinch Bugs on the label may be applied to large areas with greater safety as they are less toxic to humans and animals. Spray a barrier of insecticide around the entire house, beginning with the foundation and work out, at least 25 feet. Never spray after dark as these bugs hide in cracks in the soil and under debris and may not be killed by the spray. Treatment during the warm part of the day when the bugs are very active is most effective. Mechanical destruction of the weeds when dry usually serves to disperse the bugs faster. Spraying the weeds with oil will destroy many of these insects. No endorsement of trade names of products is intended, nor is criticism implied of similar products not mentioned. Handle insecticides with care and follow instructions on the label. Do not use around open flame or exposed foods, and clean food preparation areas after the use of pesticides. Store out of reach of children and pets, preferably in locked cabinets. Never keep pesticides in other than the original container. Never reuse the pesticide container to restore any other materials. Dispose of all empty containers by placing them in the garbage can for removal to the local disposal area. This information is to help persons involved with their pest problems. Insecticides may be purchased at nurseries and/or pet supply stores. If additional help is needed, contact with a registered pest control operator is suggested.